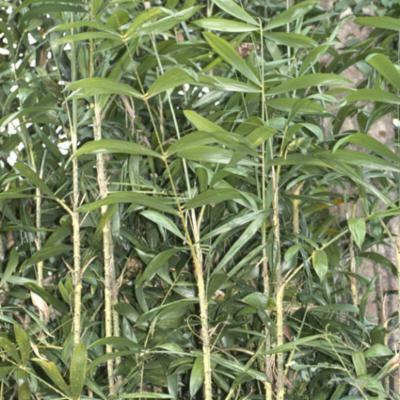 Clustering rattan climbing to 10 m or more; stem without sheaths 7-10 mm diam., with sheaths to 18 mm diam., internodes c. 15 cm long. Sheaths dark green, armed with scattered triangular black spines to 10 mm long with decurrent bases and long hairy margins, or spines more crowded and of varying size, low ridges sometimes present between the spines; knee well developed; ocrea 5-8 cm, membranous at first, becoming fibrous and net-like, conspicuous in young sheaths. Vestigial flagellum to 10 cm, usually less. Leaf to 1.5 m including the cirrus to 75 cm; petiole very short in mature stems, 2-6 cm long; leaflets c. 12 on each side of the rachis, irregularly arranged in groups of 2 - 4, shiny dark green, broad lanceolate, the longest 25-35x4.5-5.5 cm, ± unarmed, transverse veinlets conspicuous. Inflorescences inconspicuous, appearing dead even at anthesis, with up to 7 partial inflorescences; base of prophyll sparsely to very densely armed with hairy-margined spines; primary and secondary bracts covered in brown scales, irregularly tattering; partial inflorescences to 15 cm, often less, partly obscured by the tattering bracts; male and female rachillae very short, usually crowded. 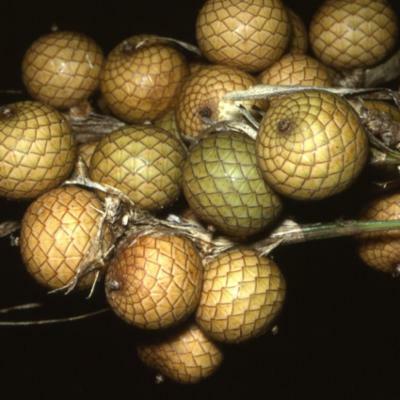 Mature fruit ± oblate, 15 x 17 mm, briefly beaked, covered in c. 21 vertical rows of pale straw-coloured scales, irregularly blotched and tinged with reddish-brown. Seed c. 10 mm diam. ; endosperm deeply ruminate. Seedling leaf not known (Fig. 49). Locally common in the 1st and 2nd Divisions. Not known elsewhere. Endemic. Clustering rattan climbing to 10 m tall. Stem without sheaths to 1 cm in diameter, with sheaths to 2.5 cm in diameter. Internodes to 20 cm. Sheaths dull green armed with scattered triangular concave hairy-edged spines 3 by 2 mm to 18 by 7 mm and abundant sinuous lateral rough ridges to 0.2 mm high; grey indumentum abundant between the spines. Knee conspicuous armed as the leaf sheath. Vestigial flagellum to 15 cm long present on most sheaths. Ocrea inconspicuous. Leaf cirrate to 1.75 m long including the cirrus to 1 m long; petiole short, not usually more than 5 cm long; cirrus armed with scattered rather than distinctly grouped reflexed spines. Leaflets about 25 on each side of the rachis, grouped in 5 groups of up to 8 leaflets but arranged regularly within each group, the leaflets to 35 cm long by 2.5 cm wide, plicate ± unarmed above rather densely armed with short black bristles on 5-6 nerves. Inflorescence male and female superficially similar, to 1 m long with 3-4 partial inflorescences, in the female to 15 cm long, in the male to 60 cm long; all bracts loosely tubular and tattering, giving the inflorescence a dead appearance. Male rachillae enclosed within bracts about 1.5 cm long, female rachillae recurved to about 5 cm long. 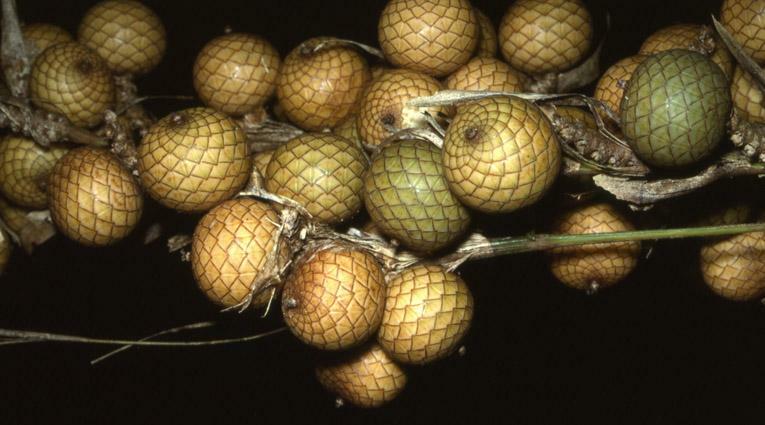 Young fruit with scales in 23 vertical rows. No other parts known. Johore: Panti East Forest Reserve. Sumatra. Clustering, slender rattan climbing to 25 m tall, forming close clumps. 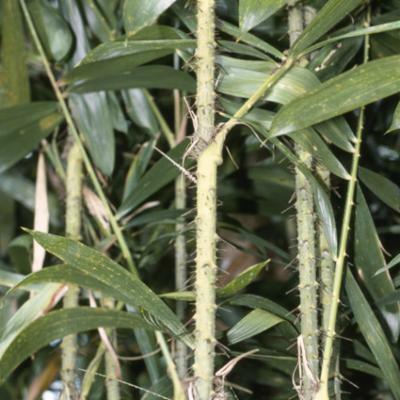 Stem without sheaths 7 mm in diameter, with sheaths 1.5 cm; internodes 10-20 cm long Sheaths dull mid-green, armed rather densely with horizontal flat hairy-margined black spines to 2 cm long by 5 mm wide; brown indumentum scattered between spines. Vestigial flagellum to 8 cm long present Knee prominent. Ocrea rather large, to 2 cm long, densely dark in-dumentose quickly tattering. 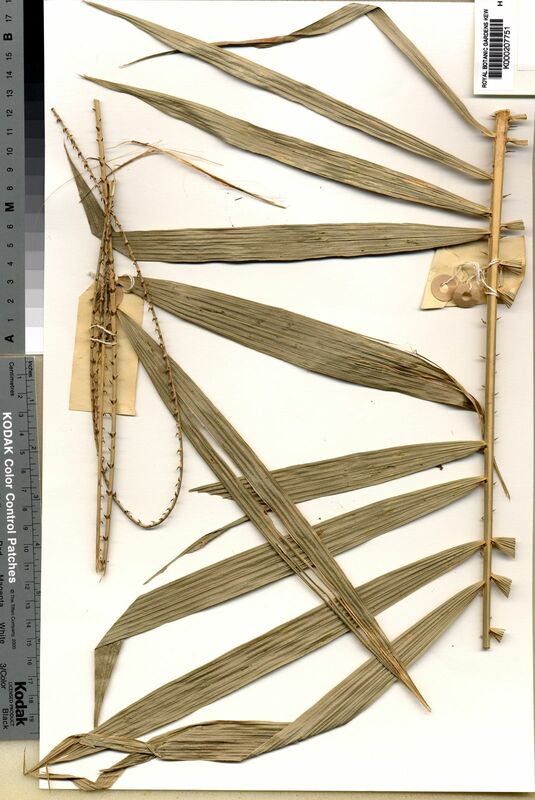 Leaf cirrate to 1.75 m long including the cirrus to 80 cm; petiole absent; leaflets about 15 on each side of the rachis, grouped in 4 groups of 2-5 leaflets, regularly arranged within the groups; groups subopposite; largest leaflet to about 30 cm long by 2.7 cm wide; upper leaflet surface unarmed, lower surface armed with short brown bristles along midrib, margins armed with black bristles. Male inflorescence to 1 m in length with first bract to 25 cm long armed with scattered and grouped triangular spines to 4 x 3 mm; allbracts tubular at the base, but conspicuously tattering in the upper pan; lowermost partial inflorescence to about 30 cm long all with tattering bracts; rachillae very short, rarely more than 1 cm in length. Fruit not known. Seedling not known. 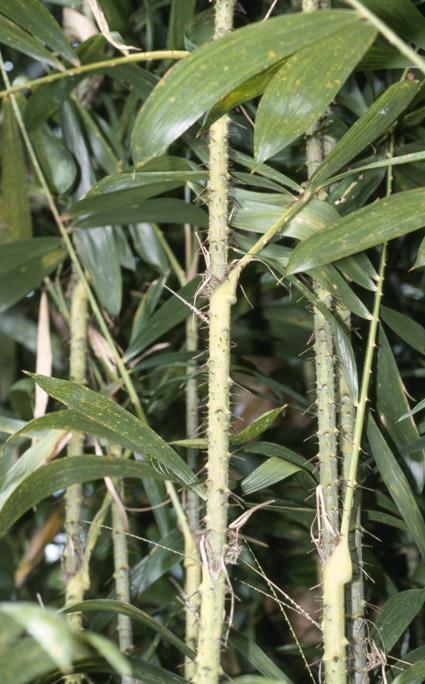 Clustering slender rattan climbing to 20 m tall; stem without sheaths c. 8 mm diam., with sheaths c. 12 mm diam., internodes to 18 cm long. Sheaths dull green or grey-green, armed with scattered triangular spines to 10 × 5 mm with conspicuous shaggy-hairy margins, smaller spines and also sometimes with ridges bearing minute spinules, deciduous indumentum present between the spines; knee conspicuous; ocrea scarcely developed. Vestigial flagellum present, to c. 10 cm. Leaf cirrate to 2 m long including petiole to 5 cm and cirrus to 1 m; leaflets c. 30 on each side of the rachis, regularly arranged near the base, somewhat grouped near the tip, the longest to 33 × 1.6 cm, linear, conspicuously bristly on the upper surface, transverse veinlets conspicuous. Young shoots bearing leaves with irregularly grouped leaflets. 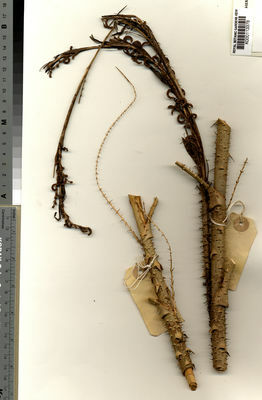 Inflorescences to 1 m long, usually less, the whole appearing dead; bracts throughout the inflorescence splitting, expanding, tattering, dark brown; male rachillae congested, c. 15 × 2 mm, mostly hidden by subtending bracts; female rachillae curved, c. 40 × 4 mm. Fruit not known. (Fig. 40). Known with certainty only from the 1st Division of Sarawak. 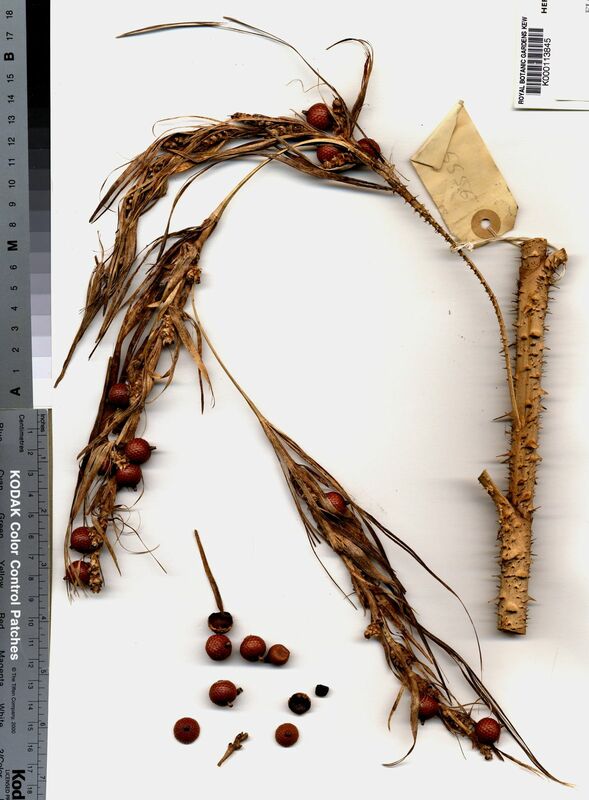 The collections from Brunei are similar to a taxon found in the Mulu National Park in Sarawak which has tentatively been identified asC. semoi (see Dransfield 1992). In Brunei this rattan is confined to higher elevations in the Temburong Basin. Known only from two collections, one from the slopes of Bt. Masasau, near Pamol, and the other in Sapa Payau F.R. on the main road between Sandakan and Telupid. Endemic. 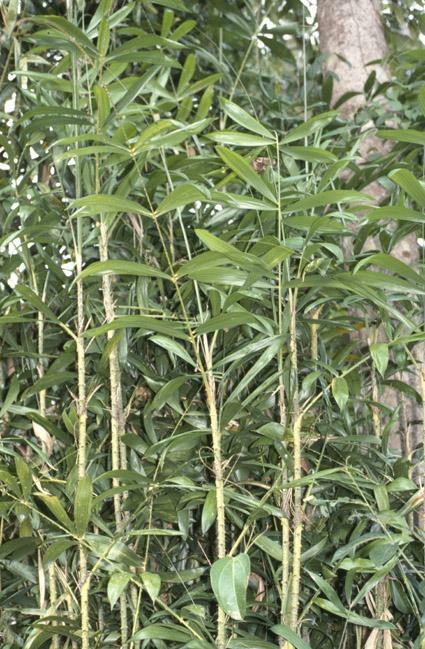 Clustering moderate rattan with stems climbing to 20 m tall; stem without sheaths to 12 mm diam., with to 20 mm diam., internodes to 20 cm long. Sheaths green or greyish green, armed with rather sparse, large, scattered triangular spines to 20 x 5 mm, with conspicuous hairy margins, brown indumentum also present between the spines; knee conspicuous; ocrea poorly developed. Vestigial flagellum present, to 10 cm. Leaf to 2.4 m long including the petiole to 40 cm and cirrus to 1.2 m long; leaflets 4- c. 10 on each side of the rachis, irregularly grouped, broad lanceolate, plicate, armed with bristles only at the tips, the longest leaflets to 40 x 7 cm. Inflorescences to 90 cm long with 4-5 partial inflorescences, the whole appearing dead; bracts throughout the inflorescence splitting, expanding, tattering, dull pale or dark brown; male rachillae numerous, crowded, mostly partially hidden among the bracts, to c. 12 x 1.5 mm, ± curved; female rachillae to 25 x 4 mm, straight or curved. Mature fruit relatively large, rounded, c. 22 mm diam., shortly beaked and covered in c. 21 vertical rows of red brown scales. Seed with flesh removed ± oblate, 9 x 13 mm; sarcotesta sweet and juicy; endosperm deeply ruminate. Seedling leaf not known (Fig. 51). Known from a few collections from the 1st and 4th Divisions. Elsewhere in Kalimantan. Endemic to Borneo. Only known from lower montane forest on Kinabalu; endemic. The cane appears to be of good quality. Produces a cane of good appearance. A good general purpose cane for baskets and other woven objects. None known but of generally good appearance.